Mukk Busster is designed to naturally decrease levels of organic sediment in lakes and ponds while reducing odors and improving water clarity. Natural enzymes produced in Mukk Busster (Lipase,Protease,Amylease and Cellulase) digest leaf litter, dead algae cells, grass clippings, dead plant matter and other components commonly found in bottom sediments. 3 Billion CFU’s (Colony Forming Units) per gram. Pellet formulation is easy to spread around docks, beaches and ponds. Spread pellets by hand tossing, scoop or hand spreader. 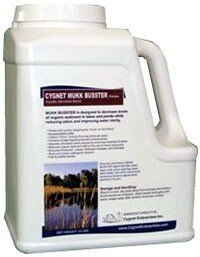 Mukk Busster is an organic digestive agent not a herbicide (plant) or algaecide (algae) control product. Apply when water temperatures are above 50 degrees for optimal biological activity. After initial desired level of muck reduction is achieved use low dose maintenance treatments to maintain the desired appearance. There are no water usage restrictions following treatment. 25' x 25' (.014) Acre Dose: .28 Lbs - less than 1/3 lb per treatment! - Apply every thirty days until desired level of muck reduction is achieved. 10 Pounds per Surface Acre for Pond, Docking or Beach Areas. Apply one-half the start-up dosage rates (see above) every thirty to sixty days to maintain the desired appearance. The Mukk Busster Product Label is available for download in pdf.